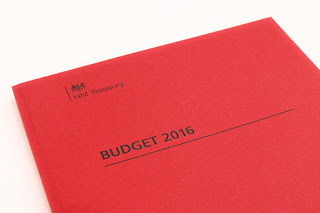 Rothbiz editor Tom Austen looks at The Budget 2016 and what it might mean for Rotherham and its businesses. The headlines will be taken by this year's Chancellor's curve ball - the sugar tax, and the fact that George Osborne has missed his own targets on the deficit as growth forecasts have been down graded - in contrast to the favourable estimates from the Office of Budget Responsibility (OBR) in November. Setting out the Government's spending plans for the years ahead, the Chancellor focused on different aspects that will be interesting to businessess - not least attempts to address the playing field regarding tax. To bring in more income to the Treasury, further efforts are being made to ensure large multinationals paying their fair share of tax, whilst some tax rates are being cut to drive growth and support small businesses. For example corporation tax is set to be lowered to 17% in April 2020 whilst at the same time the Government clamps down on VAT avoidance by overseas firms and online retailers. Support was there for the self-employed with Class 2 NICs abolished from April 2018 and two new £1,000 allowances for property and trading income from 2017. The tax-free personal allowance is also being increased to £11,500. This builds on investment previously announced to update HMRC through digital technology. Entrepreneurs' relief will also be extended to long term investors in unlisted companies. A big issue for all businesses has been business rates and the Budget revealed that a long running Government review has been concluded. The Budget states that the Government is now "cutting business rates for all properties and ensuring that the smallest businesses pay no rates at all, while modernising the tax to make it fit for the 21st century." Small Business Rate Relief (SBRR) is being made permanent and is set to double from 50% to 100%, with increased thresholds. April 2017, businesses with a property with a rateable value of £12,000 and below will receive 100% relief. Businesses with a property with a rateable value between £12,000 and £15,000 will receive tapered relief. Looking at the list of business rates payers published by Rotherham Council, some 5,700 premises in Rotherham (70% of the total) have a rateable value less than £12k and could get 100% rate relief. A further 350 could get tapered relief. This will leave local authority accountants to do the maths as councils are set to retain 100% of business rates collected in future years to top up their budgets. The documents added that local government will be compensated for the loss of income as a result of the business rates measures. Also on business property, stamp duty on commercial property is being reformed. Similar to the duty paid on residential property, new rates will be 0% for the portion of the transaction value between £0 and £150,000; 2% between £150,001 and £250,000; and 5% above £250,000. For specific sectors, nuclear energy got a mention with a commitment to developing the UK's own small modular reactors (SMRs). The Nuclear AMRC in Rotherham is pioneering how these can be manufactured and the Government said it will "allocate at least £30m for an SMR-enabling advanced manufacturing R&D programme to develop nuclear skills capacity." On steel, the budget announced business energy tax reforms that could help energy intensive industries but campaigners have called on the Government to do more. For example, the investment in plant and machinery is still included in business rate calculations. On devolution, the Budget confirms that deals struck with regions such as the Sheffield city region (SCR) will lead to the areas receiving part of £2.86 billion as un-ringfenced single pots. The SCR devolution deal with the Government is set to bring with it some £900m of additional cash over the next thirty years to deliver major regeneration, infrastructure and business growth schemes. Further resources are due to be put at the SCR's disposal as part of the "single pot" agreed under the devolution deal. Estimates for this additional share of national funding streams to be included within the single SCR pot have been in excess of a further £1 billion but this is still being quantified through discussions with Government departments. The Budget adds that up to £1.8 billion will be allocated through a further round of Growth Deals with Local Enterprise Partnerships later this year. The SCR will not get 100% business rates retention yet, as this is to be piloted in Manchester and Liverpool city regions. A science and innovation audit is planned though. Set to be focused on Advanced Manufacturing Innovation District idea it should map the research and innovation strengths and help identify areas of potential global competitive advantage. The city region's Enterprise Zone will be extended, bringing further incentives and tax breaks to promote inward investment in more areas. On transport, the chancellor backed calls from this week's National Infrastructure Commission report on improving connectivity in the North. Rotherham even got a mention in the Budget documentation - funding is set to be made available to accelerate an M1 smart motorway scheme from Rotherham to Wakefield (J35a-39). Work on J28-35 is set to be complete by "Winter 2016/17" and the overall aim is to take it all the way to Leeds.